Penguin hand-painted, custom painted, customized, personalized. Height: 4-15/16". Width: 3-1/8". Thick: .020. Weight: 0.8oz. Stamped steel. Colors shown: Body: Blacks, grays and whites. Beak: Black and gray. Feet: Flesh tone with light gray. 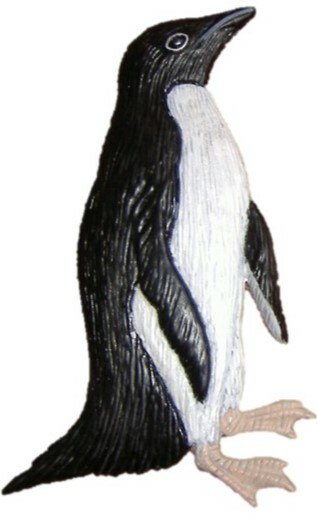 The penguin will make a unique hand-painted personalized gift or custom accent for your decor. You can choose your own colors, finishes and backings, magnet or ornament.